DALLAS -- Thomas Eric Duncan's temperature spiked to 103 degrees during the hours of his initial visit to an emergency room - a fever that was flagged with an exclamation point in the hospital's record-keeping system, his medical records show. 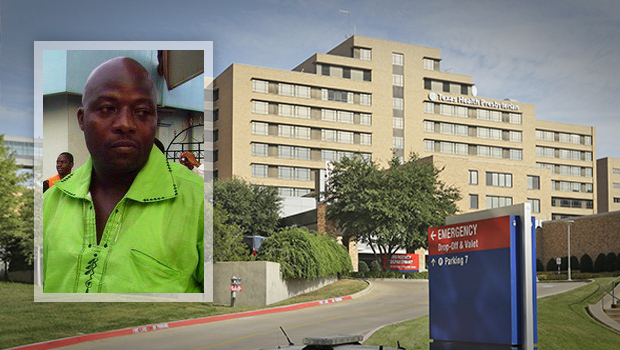 Despite telling a nurse that he had recently been in Africa and displaying other symptoms that could indicate Ebola, the man who would become the only person to die from the disease in the U.S. underwent a battery of tests and was eventually sent home. Duncan's family provided his medical records to The Associated Press - more than 1,400 pages in all. They encompass his time in the ER, his urgent return to the hospital two days later and chronicle his steep decline as his organs began to fail. CBS News correspondent Manuel Bojorquez reports from Dallas that over the last few days there have been questions from the Duncan family and members of the community about whether Duncan received proper treatment. Is Ebola outbreak the "world's next AIDS" pandemic? Duncan's girlfriend remains quarantined and spoke to CBS News through her pastor, George Mason. "She wonders, like everyone else, why it is that he was not taken in immediately and why it took so long for there to be medication delivered and why other people have recovered and he did not," Mason told CBS News. "These are her questions." In a statement Thursday, Texas Health Presbyterian Hospital said, "Mr. Duncan's physicians treated him with the most appropriate and available medical interventions." The hospital added that he was the first Ebola patient to receive the experimental antiviral drug Brincidofovir as soon as doctors "determined that his condition warranted it, and as soon as it could be obtained." It went on to say Duncan did not receive a blood transfusion from Ebola survivors because his blood type was not a match. When he first showed up at the hospital, the man complained of abdominal pain, dizziness, a headache and decreased urination. He reported severe pain - rating it an eight on a scale of 10. Doctors gave him CT scans to rule out appendicitis, stroke and numerous other serious ailments. Ultimately, he was prescribed antibiotics and told to take Tylenol, then returned to the apartment where he was staying with a Dallas woman and three other people. In spite of his fever, a physician's note dated Sept. 26 said Duncan was "negative for fever and chills." "I have given patient instructions regarding their diagnosis, expectations for the next couple of days, and specific return precautions," according to the emergency room physician's note. "The condition of the patient at this time is stable." After Duncan's condition worsened, someone in the apartment called 911, and paramedics took him back to the hospital on Sept. 28. That's when he was admitted and swiftly put in isolation. The documents also show that a nurse recorded early in Duncan's first hospital visit that he recently came to the U.S. from Africa, though he denied having been in contact with anyone sick. According to the records, Duncan was 45. Relatives said he was 42. The discrepancy could not be immediately resolved. When reached by AP, hospital spokesman Wendell Watson did not offer any immediate comment but asked for questions to be sent in writing. Doctors who evaluated Duncan did not respond to a message left at their offices. A few days later, on Sept. 30, it initially said Duncan did not tell the staff he had been in Africa. On Oct. 1, it said Duncan's nurse had been aware of the Africa connection but did not share that information with the rest of the medical team. The next day, the hospital blamed a flaw in its electronic health-records systems for not making Duncan's travel history directly accessible to his doctor. A day later, on Oct. 3, the hospital issued a statement saying Duncan's travel history had been available to all hospital workers, including doctors, who treated him during his initial visit.